Thousands of Honduran migrants resumed their march toward the United States on Sunday from the southern Mexican city of Ciudad Hidalgo. Mexican authorities on Thursday had managed to block the "caravan" of migrants on a border bridge between Mexico and Guatemala, but many later entered via a river separating the two countries. "No one is going to stop us, after all we've gone through, like crossing the river" said 21-year-old Aaron Juarez, who was accompanied by his wife and baby and was walking with difficulty because of an injury. "We are tired, but very happy, we are united and strong," added Edwin Geovanni Enamorado, a Honduran farmer who was part of the caravan, who said he was forced to leave his country because of intimidation by racketeering gangs. The caravan left San Pedro Sula in northern Honduras last week, following a call on social networks relayed by a former Honduran deputy. On Sunday morning, about a thousand migrants, including women and children, were still stranded on a border bridge hoping to enter Mexico legally via Guatemala. 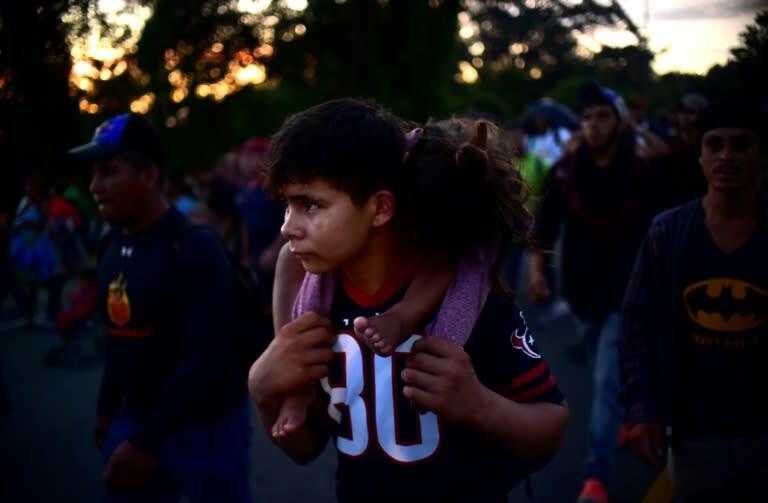 The day before, the Mexican authorities opened the border to women and children who were then taken to a shelter in the city of Tapachula, about 40 kilometers (25 miles) from Ciudad Hidalgo, Mexico. US President Donald Trump has been tweeting about the caravan's progress and thanked Mexican authorities on Saturday for their efforts to block it. "Mexico will not allow irregular entry into its territory, much less violent," Mexican President Enrique Pena Nieto said Friday evening in a video message.